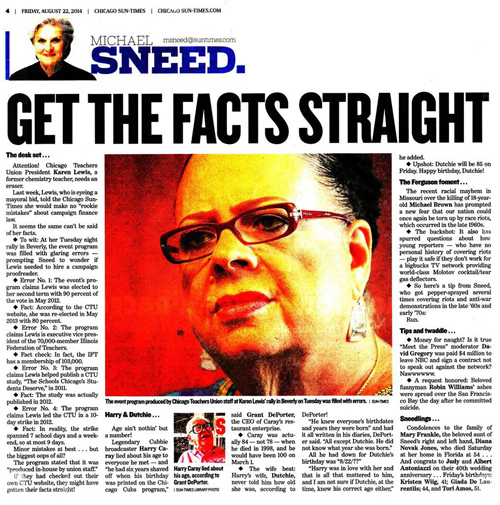 The Chicago Sun-Times had been arriving at the homes of subscribers for only a few hours when Substance began hearing from readers and others about the Sneed column on August 22, 2014. Karen Lewis, the column asserted, needed some fact checking. And the proof of the need was glaring, since the document that hadn't been fact checked before being distributed to the Lewis event, "Conversations with Karen" at Beverly Woods, was marked as having been produced by CTU staff. The biggest story in the few news pages in the August 22, 2014 Chicago Sun-Times came when Michael Sneed challenged the "facts" distributed on August 20 by the Chicago Teachers Union at the Beverly Woods "Conversations with Karen" event. Lewis's supporters still haven't explained how the facts got so wrong.The most glaring error in the document, which had earlier been reported at substancenews.net in Susan Zupan's comprehensive report on the Beverly Woods event, was the silly claim that Karen's re-election in 2013 with 80 percent of the vote had taken place in 2012 and had gotten "90 percent" of the vote. It didn't matter how the error was made. Such things will undermine the credibility of the Lewis candidacy for mayor in the months ahead. Given the fact that Lewis's enemies --- including every union buster and teacher hater in the USA -- will be combing the record for issues to divert the attention of the public from the issues in Chicago and the main issue, which by the February election will be who is better suited to serve as Chicago's mayor from 2015 into 2019? Should it be Rahm Emanuel or Karen Lewis (or someone else)? There was no excuse for the "rookie errors" that went out in that Beverly Woods leaflet. Whoever gave final approval to it had easy access to the facts within a hundred feet of the office that finally approved it. A phone call to Substance could have set the record straight if nobody else had been available. But nobody who knew those many facts was asked to fact check what amounted to the official handout on August 20, 2014. And since the handout was for the biggest "conversation" to date when Karen Lewis arrived at Beverly Woods, the mistake is serious, but not fatal at this point in history. Worth noting is that the 2013 election victory was for the entire CORE slate. That slate included 150 people, from the four officers (Karen Lewis; Jesse Sharkey; Michael Brunson; and Kristine Mayle) to the 44 candidates for the union's massive executive board. Ultimately, it also included the 150 candidates for the union's delegations to the conventions of the Illinois Federation of Teachers (IFT) and the American Federation of Teachers (AFT). [Disclosure: this reporter and his wife Sharon are both delegates and members of CORE. Sharon Schmidt, a teacher at Steinmetz High School, is also an elected "high school vice president" on the CTU's 44-member executive board]. There is always a temptation in American politics to reduce complex electoral realities to simple-minded personal narratives. And some of Lewis's supporters have already succumbed to the temptation to do that, making leadership a cult of personality rather than a team effort. But Lewis herself knows better, and has learned many lessons since she first emerged as a public figure following the run-off election in June 2010 that put the CORE leadership into power. Lewis herself is the first to admit that her two victories for the leadership of the 27,000-member (not "30,000-member..." as is still being claimed by some) Chicago Teachers Union was a team effort. That team effort will continue during the upcoming months, despite the attempts by some individuals to become courtiers to a new royalty. Which makes the rookie mistake of August 20 at Beverly Woods even more interesting. It really doesn't matter who made the mistake, but only how the Lewis campaign organization is going to hold the person who made the mistake accountable. One of the ironies of the brief media splash about the inaccuracies in the union handout at Beverly Woods is that the union had arranged for Walter Jacobson to moderate the event. Jacobson (as noted in a comment to substancenews.net) had been the high-profile media pundit who had characterized the original CORE campaign, in 2010, as pitting the "rookies" (CORE) against the seasoned veterans (the UPC's Marilyn Stewart and the remains of her team, which had split three ways in order to open the door for the CORE victory). By August 20, 2014, Jacobson had obviously changed his mind and gotten more of his facts straight (although Jacobson, as reporter Susan Zupan noted, was wrong about Chicago's "elected school board"...). The challenge for the Karen Lewis campaign for mayor is that the whole world will be watching. The candidate and many of her supporters have become seasoned enough to be ready for that battle against a world famous celebrity with the backing of billionaires and Hollywood, but the campaign can't afford too many "rookie mistakes" like the one that exaggerated the CORE victory in 2013, getting both the margin and the timing wrong. Substance will be reporting on the upcoming municipal elections in Chicago in details, and from the wards as well as the central events. And as we did in our coverage of the August 20 Beverly Woods story, we'll be fact checking ourselves and the others there as this unfolds in the more dramatic months ahead.